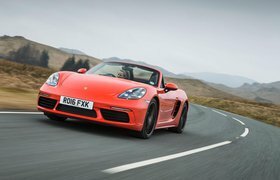 2016 Porsche 718 Boxster S review | What Car? What’s the value of two cylinders? How much can it alter a car to lose a couple of pots and gain a turbo in their stead? Well, we’re here to find out in the radically updated 718 Boxster, which has gone through exactly that process. it's still mid-engined, rear-wheel drive and available with a six-speed manual or seven-speed dual-clutch ‘PDK’ automatic gearbox, but seated snugly behind the driver is now a turbocharged four-cylinder engine, delivering more power and lower emissions than the six-cylinder unit it replaces. Crucially, note that you’re not looking at a Golf GTI engine in a Porsche; this is a bespoke powerplant unique to Porsche, with its cylinders lying flat (as they did previously in the Boxster) rather than upright as they do in the vast majority of four-cylinder engines. 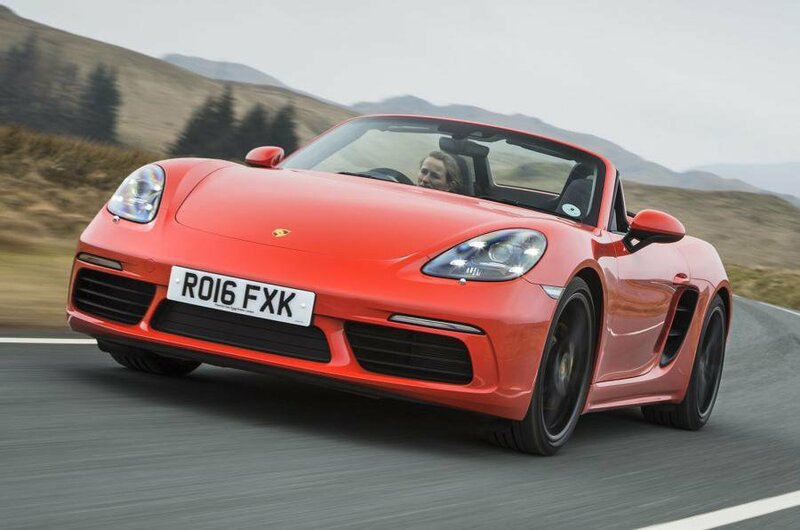 The Boxster S that we’re testing gets a 2.5-litre engine with 355bhp, and the standard car a 295bhp 2.0-litre. On top of that, all the body panels but for the rear engine cover have been changed and a new front axle has been inherited from the 911 Turbo, while the rear axle now has strengthening components from the epically brilliant Cayman GT4. Add to this the new brakes and a slightly faster steering rack and you’re looking at what amounts to rather more than your average facelift. What’s the 2016 Porsche 718 Boxster S like to drive? That engine - blimey does it make this car feel fast. Really, really fast. It picks up well from low revs, but doesn’t really hit its stride until you inch past 2000rpm, at which point the revs pick up with a noticeable if manageable surge. And then it just keeps going, winding up the revs smoothly and with a seriously aggressive build of pace, right up to the 7500rpm redline. In fact, being so long-revving and given the quite tall gearing, we never needed anything but second or third gear to get the best from the car on the roads around Wales where we did our testing. Having said that, you can also change up earlier and just enjoy the less frantic but still exhilaratingly gutsy mid-range. In reality, this engine has lost something of the effortlessly predictable, sweet-revving character of the old engine, while throttle response has also become a touch softer and less precise. Purists will notice it, yet in most situations the new four-cylinder feels much punchier and its performance is more accessible since you don’t have to rev it to get the best from it, as you did with the old engine. The handling is just as sweet as it ever was. Some might find the more aggressive initial steering response takes some getting used to, but there’s still a zen-like precision and sense of connection to the car that makes it effortless to place precisely. Our test car came with the optional, £1133 adaptive PASM suspension and 20mm lowered ride height, which did result in a firm but well-controlled ride. It bobs about a bit over undulating surfaces and thumps over bigger intrusions, but the damping keeps things from ever becoming harsh or jarring even in the firmer setting, and with body control and rigidity hard to fault, there’s no doubt that the Boxster S remains a car that thrills even at normal road speeds, and that you could enjoy living with every day. Refinement is as good as ever, although the new engine’s angry, metallic warble is a tad intrusive even at a steady cruise with the roof up. What’s the 2016 Porsche 718 Boxster S like inside? The interior remains similar to before, which means a snug but comfortable cabin with supportive seats (now electrically adjustable as standard), a good array of classy-feeling, well-textured materials and a fairly user-friendly dash. A new, quick-responding 7.0in touchscreen forms the focal point and is familiar from the new 911, with its mostly intuitive menus and clear graphics. You’ll still want to add plenty of options, mind, including £1052 sat-nav and Bluetooth option, and £284 DAB radio, before you even start on chassis and styling upgrades. A 918-inspired steering wheel is also a welcome addition, and you can even choose a slightly smaller, slimmer-rimmed ‘GT’ wheel over the already excellent standard wheel. 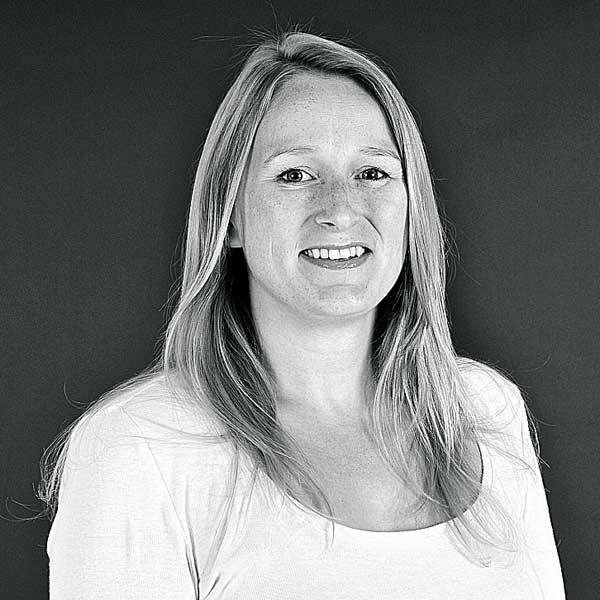 The boot in the car’s nose will still give you enough space for a sparingly packed weekend away, and rear visibility is predictably restricted, although it’s no worse than you’d experience in any two-seat roadster rival. If you fancy a high-end sports roadster, the new 718 Boxster offers the sweetest handling as well as the most luxurious interior, and now with dramatic performance whether you like surfing mid-range torque or exploring the wailing redline. However, it’s not cheap these days, so by the time you’ve added the essential options you want, you’ll be looking at a £10k premium over an Audi TTS Roadster. That’s a lot of money, and it’s easy to see why you’d take the saving and the four-wheel drive option. We’ll have to wait to get both together on UK roads before we can make that final call, but on this evidence, and despite accepting that the new engine has lost some of the purist appeal of its predecessor, the Boxster S’s depth of handling brilliance and bombastic performance still makes it the best car in this class.